We are currently waiting for Rachel Notley to call the election as we believe it is time for a change. I, along with the United Conservative Party under the leadership of Jason Kenney hope to be that change! Our United Conservative government will introduce a Job Creation Tax But on employers that will reduce the provincial tax rate on job-creators by one-third. This will give Alberta the lowest taxes on employers in Canada and help bring jobs back to Alberta! We would like to kick off our campaign by inviting you to join our upcoming open house. 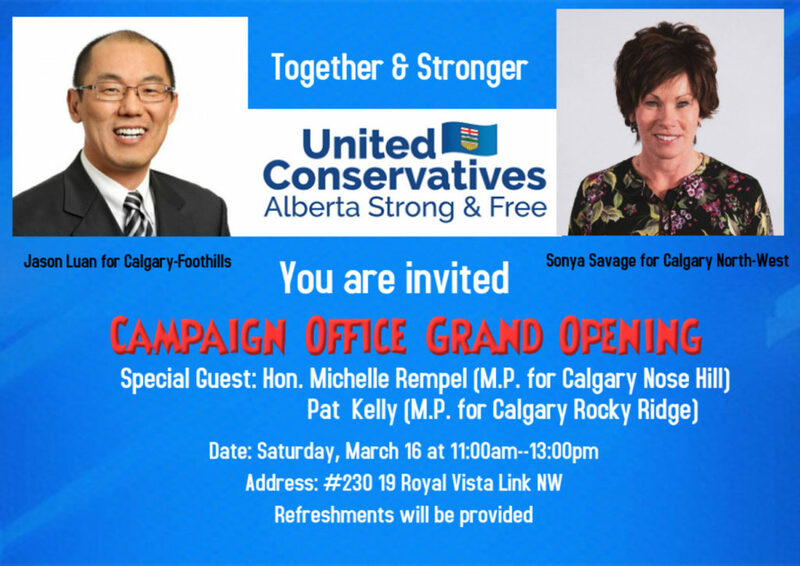 Please come out to meet me, other members of the Calgary-Foothills team and our dedicated volunteers. RSVP by sending email to jason.luan@jasonluan.ca. I hope that I can count on your support! Please feel free to contact me if you would like to get involved.